DIRECTIONS: From Tupper Lake, head south on Route 30 towards Long Lake. Take an immediate left onto the Lake Simon Road after crossing the bridge over the Raquette River. The cemetery is located at the residence of Thomas Fortune, whose home is the second driveway on the right. Permission should be obtained before visiting this cemetery. This cemetery was transcribed and photgraphed by Joyce M. Ranieri on 23 July 2001. 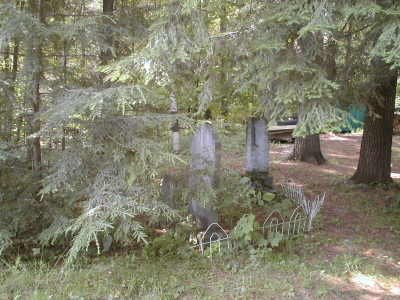 This cemetery is located on private property. Many thanks to Thomas Fortune for allowing me to tramscribe and photograph his ancestors' graves. According to family history, there should be approximately nine graves located here. Only three stones and two footstones remain. Mr. Fortune told me that the McBrides were among the first four families to settle in this area permanently. They arrived in 1856. Leon Son of J. F. & S. S. JOHNSON Died Apr. 22, 1892 AE 9 Mo's. We miss thee. C.W.H. McBRIDE Died May 8, 1895 Aged 21 Yrs. 10 Mos. Catharine Wife of G. H. McBRIDE Died Mar. 14, 1876 AE 33 Y'RS.